"Inspired by marshmallow shooters, this air-powered tampon gun turns your feminine hygiene products into high-flying projectiles. Have a shootout between rival tampon brands, or use it as a fun alternative to paintball. 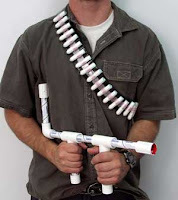 The tampon shooter has a range of 10 to 20 feet depending on your ammo and lung capacity. The matching bandolier lets you carry a full “clip” (i.e., box) of 20 tampons, so you’ll never be caught short in the heat of battle..." Read more, get a supply list, watch a video of the final product in action, then plummet into a deep morass of self-loathing by continuing onward to Tamponcrafts.com.